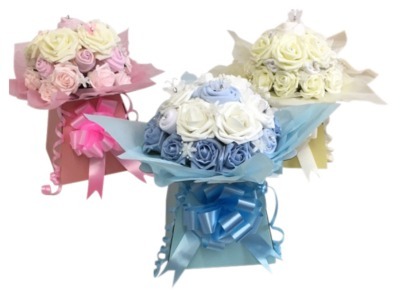 Baby bouquets are the perfect gift for those hospital visits that no longer allow real flowers, or the perfect present for a baby shower or even a maternity/paternity gift. All our bouquets are made in such a way that they are very easily pulled apart when it's time to use the gift, no sticky tape to remove from the clothing due to our unique method of assembly! A beautiful baby bouquet, filled with baby clothes all rolled to form rose shapes. Easily taken appa..